This farm which can be seen from the Odsal-Halifax road (A6036) stands just beyond Shelf Parish Church. 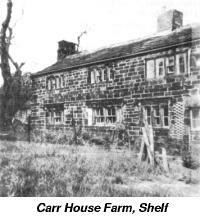 Some documents give the alternative name, Causey (or Causeway) Head Farm, suggested no doubt by the causeys or raised flags which still form the approach to it.1 The boundary between Buttershaw, Bradford and Shelf is Blackshaw Beck a stream mentioned in the farm's deed of 1600. The north side of the building as seen from the main road is substantial but undistinguished, whereas the south side has good mullioned windows and a splendid chimney stack. As in many 17th century buildings the corner stones are massive. A large barn almost as big as the farm stands at right angles to the main block. Until 1987 the farm was owned by Mr Sam Jagger, who, like the building itself gave an impression of sturdy independence. This family trait is well illustrated in a story told by Sam of a contest in the early 1920s between his father and the agent of the Saviles, lords of the manor of Shelf for centuries. During a conversation with Mr Jagger, I learnt that he was the owner of a fine collection of deeds and indentures dating from 1600, many with seals and some in Latin, which I was allowed to examine. So the slow process of selection and transcription began. It came as no small surprise to find that an unpretentious farmstead like Carr House should possess a collection of records of a kind more often associated with buildings such as High Bentley or Shelf Old Hall. For the purpose of this article I have chosen a representative selection from between 1600 and 1794: there is a natural break in 1805, when a schedule of the previous documents was drawn up. "to be taken in and enclosed of the waste or common of Shelf … in any place or places now lying open and not enclosed within these bounders following, that is to say between the water or brook dividing the township of Shelf and the parish of Bradford called Blackshaw Brook alias Howden Brook on the east and north part, the town or lordship of Northowram on the west part and the town or lordship of Hipperholme on the south part…"
"for sinking, forming and making pits for digging and getting of the same, coals, and necessary, sufficient and reasonable ways and passages … to and from the said pits…"
For his part John Midgley had to make an immediate payment of £72 and an annual rental payment of 13s. 4d. 'by even portions' at the Feast of Pentecost and St Martin the Bishop in winter.4 He also had to attend the Court Baron of Sir George Savile in the manor of Shelf. Before specifying the individual parcels of land, the deed gave the total area enclosed as 39 acres 3 roods 6 perches, so the residue would amount to about 1½ acres. As the map of Shelf shows, the two Brackenbeds were close to Blackshaw Beck, with Giles Hill not far away. This indicates how distant some of the enclosures were from Carr House. In addition to Wadehouse above, several of Shelf's old halls and farmsteads, such as Dean House, Jaqueroyd, Low and High Bentley and Shelf Old Hall, were known to have been in existence at this time but Carr House Farm is not among them. It is not mentioned in these documents until 8 March 1666, when John Smith became the tenant. A branch of the Bottomley family settled in Shelf during the early part of the 18th century and Moses Bottomley (b. 1795) lived at Wade House. This branch of the family built a new part to the house and it was Moses, the worsted manufacturer, who also built Victoria Mills in 1839-40. "all that messuage or tenement with the appurtenances commonly called and known by the name of Carrhouse, and all and singular the houses, edifices, barns, buildings, folds, orchards, gardens, backsides, tofts, crofts, and thirteen closes of land, meadow or pasture…"
No acreage is given, but the names of the closes are: three Moor Closes, three Rough Closes, the Upper Swamps, the Lower Swamps, the Ing by the house, the Pitt Close, the Long Close, the Close before the door and the Croft above the laith, all of which were granted to John Smith for a payment of £360. The deed also mentions mines and pathways to mines. 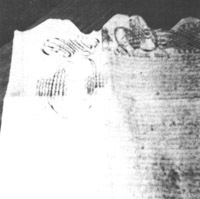 As may be seen from other documents in this collection, landlords and farmers, besides being concerned with agriculture and the management of land, also had a keen eye to what lay beneath their closes. The supplies of coal and ironstone mined in this area may have been small and not of first class quality, but the possession of mineral rights often made the owners self-sufficient. "peaceably and quietly permit and suffer Grace and Mary Birkhead, daughters of the said Robert Birkhead, to dwell remain and inhabit in one little house, parcel of the hereby granted premises now in the occupation of Susan Holdsworth … for the term of seven years … under the yearly rent of one peppercorn yearly at the Feast of Christmas if the same be demanded." He also had to allow the two ladies the right to obtain all the coals they required from the Rough Close, 'at the pits therein now sunk', for the next seven years, the coals to be loaded and delivered when needed. Although the tenant's name here is 'Smith', in later documents the spelling is 'Smyth', and as scribes were not always consistent in these matters it is not unreasonable to assume that 'John Smith, yeoman' was a member of the Smyth family mentioned in the following Carr House documents, perhaps John of Miryshaw, the father of John Smyth who bought the Heath estate. In Bradford Cathedral there is an impressive tablet to the memory of John Smyth of Miryshaw (A), his wife and their ten children. Of these, John (B) was said by James Parker (Bradford Antiquary, pt. 8, 1903, p.352) to have lived at Revey Hill Top Farm, where he amassed a huge fortune as agriculturalist and woolstapler. In 1705 he built and endowed Slack End Charity School, and when it closed the endowment was transferred to the school founded by the Low Moor Company, later to become Holy Trinity Church School. In 1709 John (B) bought the Heath estate, near Wakefield, which eventually became the family seat. The inscription on the Smyth monument in Wakefield Cathedral says that he was born at Revey, near Bradford, and died in 1729, aged 76. This document is a copy of probate and will of Richard Smyth, gentleman, of Heath, near Wakefield, the Smyth family being important tenants of Carr House Farm.5 Richard, who died in 1730, ensured that all his debts and funeral expenses should be paid out of his estate, and left 'unto my dear wife an annuity of 25 pounds but only so long as she shall continue my widow and no longer.' Further gifts to his wife included his chariot, a pair of mares, all the furniture in his best chamber, and 100 pounds in cash. She was to be allowed to use half his plate and half his linen during her lifetime, but on her death they were to be returned to the estate, allowing for reasonable usage. The remainder of his possessions were bequeathed to his eldest son, John, when he reached the age of 21. Richard's executors were his brother, John, Thomas Edmunds of Wusper (Worsborough) and John Turner of Dewsbury. They were to supervise the guardianship and education of his four children, and their estates and fortunes. In a codicil, Richard re-emphasised that his wife should use the plate and linen only so long as she continued as his widow. He then relented by leaving his wife 'the gold which she useth' and all her rings, jewels, diamonds and attire. A marriage had been arranged between John Smyth of Heath, Wakefield, and Bridget Foxley, only daughter of Benjamin Foxley, a London merchant. This document is a tripartite indenture, the three parties being John Smyth, Benjamin Foxley, and lawyers Harpham Green of Wakefield and Ayscough Fawkes of Lincoln's Inn, Middlesex. The bride brought a dowry of £4,000, part of which was to make provision for herself should she survive her husband, and for any children of the marriage. John Smyth promised to reward his legal friends, Green and Fawkes, with estates and messuages, some of which were in Halifax township. Among many interesting items in this settlement was a sum of £1,070 vested in the Aire and Calder Navigation, and an investment in engines and other works for supplying the town of Doncaster with water. 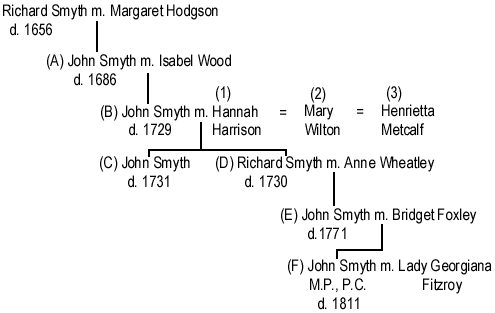 John Smyth's grandfather, also called John, who bought the Heath estate in 1709, was a promoter of the Aire and Calder Navigation, with an investment of £500. He became a trustee of the Wakefield undertakers, with a holding of £2,140 in 1720.6 The investments mentioned in the above settlement were probably part of the stock inherited by the grandson through the estate of his uncle, inevitably called John, who was the eldest son of the first 'Squire of Heath'. This indenture is between the foregoing John Smyth, now of Carr House Farm, and Moses Kellett, clothier, of Shelf, whereby the messuage, barn and outbuildings were leased to Moses for 21 years, on payment of an annual rent of £12. The lease included various closes, together with the 'intack lying in Shelf'. John Smyth was to have access to all mines of coal, lead ore and clay, and to quarries of stone or slate, including passage-ways and rights of cartage. He also claimed access to 'all manner of timber woods and underwoods', and the right to convert into charcoal the said trees and woods. Moses must not 'lop, top, crop or cut any of the trees other than for repairing fences'. "for the better husbandry he shall not take more than three crops for every such liming and manuring so it shall not be impoverished." This kind of stipulation was usual in many transfers of land. John Smyth insisted that three years before the termination of the lease, Moses should sow a sufficient number of hay seeds, but not clover, in all the ploughing ground, to lie for grass or pasture 'in a good and orderly way'. For every acre which Moses should plough and sow with corn, grain or seed he must pay to John Smyth the yearly sum of £5 over and above the rental. A final reminder to Moses was that he should yearly set and plant in the hedges and hedgerows young oak, ash or elm trees, and these trees should be preserved from any hurt or damage. "together with waters and watercourses, with rights of common of pasture and turbary, moors, woods and underwood, and rights and liberties of pews and seats in Coley Chapel and in the parish church of Halifax, and reserving to John Smyth and his heirs all coals, mines, seams of coal whether opened or not in and under the said closes and lands with full liberty to dig or sink shafts and carry away the coal in carts and carriages." Although John Smyth reserved the right to all the coal under the closes he had no intention of working the seams himself because by an indenture of the same date he sold the 'coals, mines, veins and seams of coal' to Edward Leedes for £280.8 As part of the bargain, Squire Leedes had to make 'reasonable satisfaction' to those who farmed the land for any damage he might do to their crops and pasture. He was also bound to fill in the mines and level the pit hills within a year after the coal-getting ceased. This indenture between Jane Dyson of Wakefield, widow, only surviving sister and heir-at-law of Susanna Buxton, deceased, and John Stocks, collier, now of Northowram, provides that in consideration of the sum of five shillings being paid to her by Stocks, Jane Dyson has leased the farm 'commonly called or known by the name of Carr house, otherwise Causeway Head, heretofore in the tenure … of John Terrv … but late in the occupation of John Priestley as tenant or farmer'. The lease also included rights of common and turbary, that is permission to cut peat and turves, but as usual coal-getting was forbidden. The acreage was the same as in 1776, with fourteen closes as before, except that 'Ridgefield' had become 'Bridgefeld'. The document ends on a note which is strange to us, but most welcome after much tedious repetition. John Stocks must pay to Jane Dyson 'one Red Rose Rent only in the time of Roses (only if the same shall be personally demanded)', the explanation being provided in the following clause, 'By force of the statute made for transferring of uses into possession'. The price of five shillings indicates that this was a lease for a year, and the token rent, a red rose (or sometimes a peppercorn), gave the purchaser immediate possession, although neither was ever likely to be demanded. At the same time, or shortly afterwards, a 'Release' would be drawn up conveying the property for ever, at the full purchase price. There is no document of this kind in the Carr House collection but it is registered at Wakefield, Registry of Deeds (Ref. DO 251-328). "all those four closes of land called Carr House, or otherwise Causey Head in the township of Shelf commonly called by the names of 'The Two Rettard Closes', 'The Delf Close' and the 'Four Days Work', containing altogether seven acres … in the tenure of John Terry, late in the occupation of John Priestley, which said lands were bought of John Smyth of Heath, near Wakefield, in 1776. "10 On this land Samuel Aydon and John Elwell erected Shelf Foundry, which was bought out by the Low Moor Company in 1824. The 'Schedule of Title Deeds' compiled on 14 October 1805 lists all the indentures linked with the holders of the estate and provides useful copies of probates and wills. Just before the schedule was made, on 6 July 1805, John and Michael Stocks issued a bond to James Baines of Halifax whereby the farm was mortgaged in the sum of £600. James Baines acknowledged receipt of the schedule and undertook to return it to the Stocks family on repayment of the mortgage, which was done in July 1812. The Carr House documents continue the story which began with the first recorded reference to Scelf and its single ploughland in the Domesday Book. They illustrate the process of winning land for arable farming and pasture from the bare moorland and waste, since 1600, which was the beginning of a more prosperous period. From then onwards there is evidence of careful farm management, with the exploitation of assets as diverse as coal, pasture, brushwood and church pews. Sadly, Sam Jagger died, aged 75, on 1 June 1987, but long before that he made all his documents available to me, with permission to use them for the purpose of this article. Carr House Farm is in good hands, and unlike more famous buildings which have fallen into decay, it remains as a living part of the history of Shelf. Since my introductory article on Shelf in Third Series No. 2, 1986 I have had a letter from one of our members, Mrs Jean Booth, who told me that her family were among the many Scottish immigrants to Bradford. In 1910 her great-great-aunt and husband Robert Botterill, a coachman gardener, moved to Shelf from Bradford and rented a cottage with flower gardens at Berry Bottoms. Here Mrs Botterill provided teas and refreshments for the weary mill-workers from Bradford, to whom a visit to Shelf and Judy Woods was a favourite week-end treat. I have also been contacted by descendants of two important Shelf families of the 18th and 19th centuries, the Sugdens and Listers. John Sugden, surgeon, commissioned the building of Shelf Windmill in 1789, while Joseph Lister was a township councillor during the period 1801-1842. Finally, I wish to thank Miss Lilian Robinson for making many valuable suggestions during the preparation of this article.